With a wide range of rower brands and models made available on the market, along with a million and one rowing machine reviews, finding the perfect indoor rowing machine for CrossFit workouts and high-intensity interval training may not be so easy. In fact, it could work out to be difficult than the workout itself! Rowing is a priceless addition to your CrossFit training arsenal. Rowing is one of the most basic full body exercises you can think of for a good cardio workout and low-impact exercise. Swimming and running are two good exercises for cardio but rowing exercises will put your muscles through distance motion with some serious resistance. 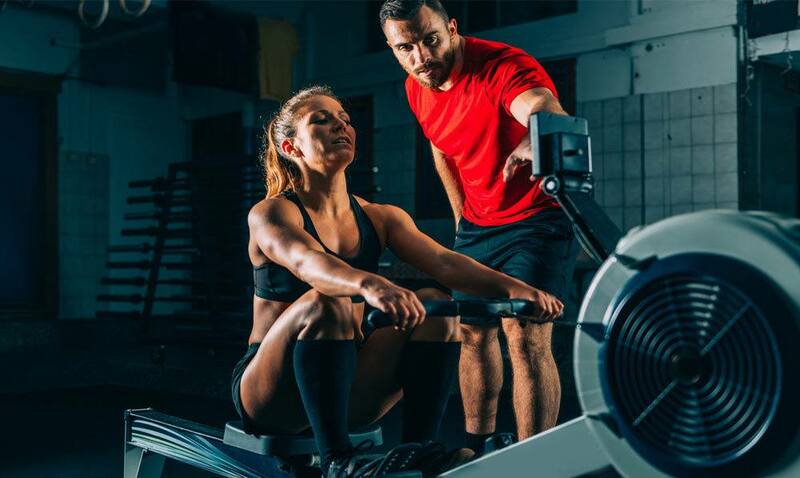 In addition, a rower workout will give you what other exercises have not like Vo2 max, through a demanding and low impact cardio training session. Olympic rowers rank among the best athletes for Vo2 max. This is proof of what you can gain through rowers. It is not surprising that ‘Rowing WOD’ is becoming famous among other “crossfitters” in the world. To add intensity and variation to your workout, you should consider adding rowing exercise to your CrossFit training. On the rower, crossfitters can balance the lifting, pushing, and the pressing movements of CrossFit. CrossFit can move like deadlift, burpees, and more lifts. Through the pulling exercise, your shoulders, quads will get smashed, including your posterior muscles. You can practice your rolling exercise indoors. You can also do this at any weather conditions. Since rowing exercises are efficient yet intense, you can have a great result in a relatively short period. This, and many more reasons,makes rowing a great workout, especially if you are after positive results in a short time. Rowing machines have four different types of resistance which are water, piston, magnetic, and air or fan. The water resistance model is a good simulation for positive rowing. Just like air models, the water resistance model permits a smooth and constant movement. The resistance experience in a water rower is as a result of a variable amount of water located in the resistance tank. This causes either an increase or decrease in the amount of tension on the wheels. You can customize water resistance but changing its resistance like the different rower types is not possible. Unlike other types of rowers, water resistance is not common. They are the heaviest of all types of rowers. Water models make noise but not like the one produced by the air rower. Resistance in a piston rower is as a result of the compact hydraulic cylinders that are attached to a machine arm. The piston rower is smaller than other types and is generally cheaper, too. If you need a rower that is inexpensive and won’t take up a lot of space, you might consider getting a piston rower. Nevertheless, piston resistance rower is slightly less effective for a workout as there is no smooth motion like the other types of rowers. Piston rowers are not really suitable for crossfitters because they can’t meet the workout intensity other rowers’ options. The resistance experienced in a magnetic rower is controlled by strong electromagnets. 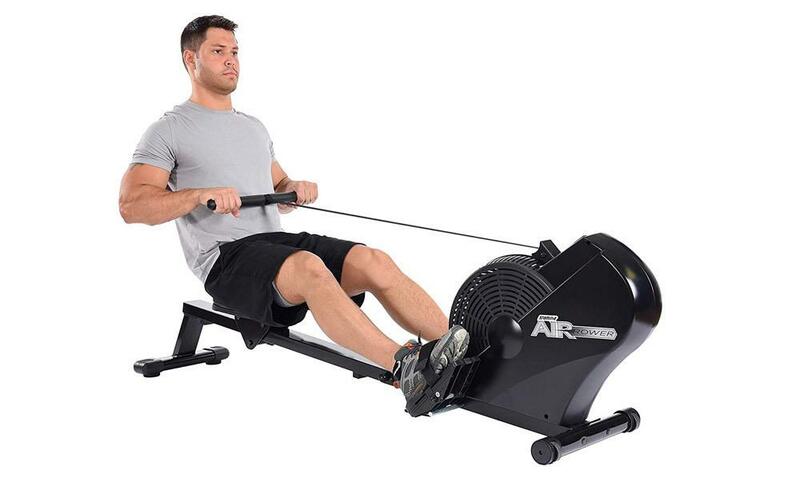 This type of rower has a similar resistance to the piston rower. However, the magnetic rower machine has a smoother operation. You can also adjust the intensity of the resistance. The magnetic rower is large and can occupy a lot of space. Its long rail can’t be separated for storage nor can it be folded. However, it does offer super quiet operation. An air rower is also known as a fan rower. Among other types of rower, the air or fan rower is most popular and common among people that use the rowing machine and CrossFit athletes. The resistance of the air rower is as a result of the damper lever on the flywheel side.  The damper lever adjusts the amount of airflow that comes to the wheel. An air rower gives the smoothest motion out there. When the motion is smooth, there would be an effective workout. One of the major demerits of this rower is noise. It is the noisiest models to use for rolling exercise. Air rowers are the largest models found on the market. In terms of quality to cost ratio, air resistance is the most expensive. If you are looking for the best-valued rower, it is the air or fan rower. The ergometer, otherwise known as the erg, is the computer that keeps the record of all your exercise stats such as stroke counting. It also keeps the record of the burnt calories and your speed. For an average man who is rowing, about 500–600 calories per hour are burnt. To track your progress as you workout, you need this handy little erg tool. An ergometer is an essential tool for crossfitters. Most of the new models will be ergometer rowing machines. A good ergometer machine will display its reading in large font size as to be easy to read. Split time and the stroke rate are two basic stats as you embark on your rowing training workout. The stroke rate does not only display your effort but it also assists you in controlling your rhythm. Furthermore, the split time will show you your applied force after each stroke. Once again, the split time is essential to maintain a regulated and smooth workout. The split time also keeps track of your intensity at an interval as well as regulate your momentum. Another thing that is important when it comes to workout is the watts readout. The watts readout tracks the exact power that is produced by the wheel. This directly shows you your overall intensity and the quality of each of your stroke. No matter which overall workout intensity you choose or the individual fitness of the rolling machine, there is a need for you to maintain proper technique and right posture to ensure a good result from any rowing workout. Although the effectiveness of a rowing workout largely depends on training and practice, the machine style has a role to play. To get the best out of rowing workout, make sure your rowing machine has the right seat height. Also, fix your rower to have the right rail length that will match the size of your body. Another thing to consider before purchasing a rower for a crossfitting workout, have a look at the width and length of the handle. This means that you must make sure it has perfect for grip distance and your shoulders. The stability and weight capacity of a rower should be taken into consideration too. 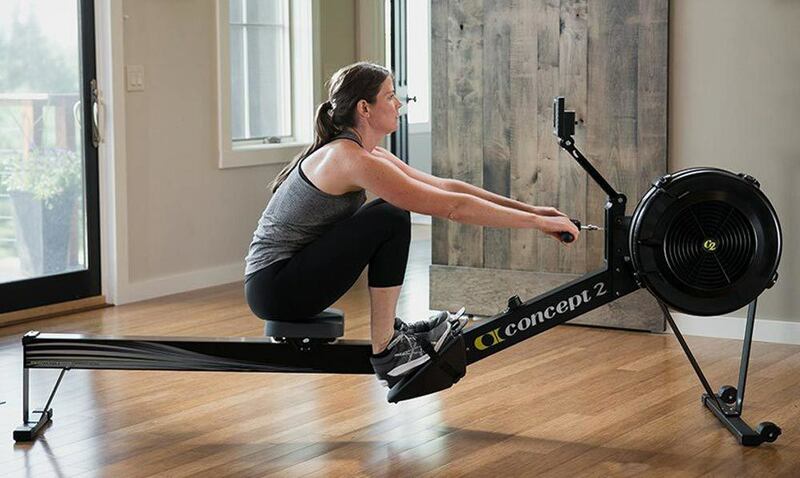 Concept 2 Rowers are commonly used by many crossfitters. This type of rowers is the only option for mixing indoor rowing into a WOD. 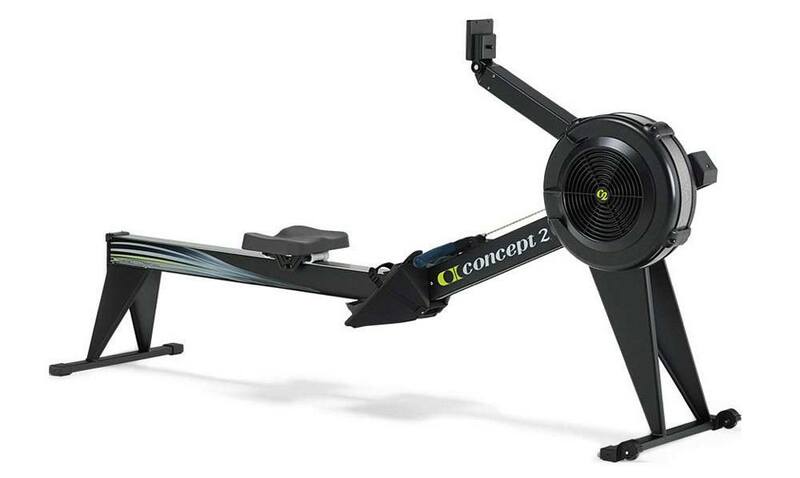 The features of Concept 2 rowers make it a popular choice for many crossfitters. Concept 2 rowers have a smooth glide that encourages a seamless rowing movement. The Concept 2 rower is designed to conserve noise. As an air resistance rower, it is expected to be noisy during operation but this is not true. An internet-based fitness tracking system known as Concept 2 logbook has a role to play in the familiarity of the Concept 2 brand. All Concept 2 models are air resistance rowers, easy to start, and each model has different features for distinct physical needs. Every model comes with an ergometer. There are currently two Concept 2 ergometers, known as the PM3 and the PM4. The PM3 and PM4 have things in common such as stroke rate standard split times, intervals watts, time, and averages. The PM3 and PM4 come with inbuilt games. The PM3 allows you to compete in a race with additional equipment against other machines. The PM4 allows you to wirelessly set up a race. The PM3 can be connected to a heart rate monitor together with additional extras. Furthermore, the PM4 ergometer comes with a native heart rate function, an antioxidant monitor, a rechargeable battery, and increased memory capacity. You can replace or change monitors although each of the Concept 2 rowing machine models can have one or the other display as its default standard. The Concept 2 Dynamic is the extreme step up to high-level rowers for CrossFit. The Dynamic Concept 2 rower is the best rower for athletes and kayakers who train on water for rowing. The Dynamic Concept 2 rower has a shorter overall length when compared to Model D and Model E concept rower. It has a length of 76”. Dynamic rail can’t be separated for storage. It is large and needs good floor space.Unlike the Model D, Concept 2 and model E, the Dynamic C2 footrest moves without restrictions and as such will give you additional stability. Dynamic Concept 2 comes with the PM3 ergometer as standard. This type of rower is the closest thing to rowing on water. It is very large and as such difficult to store when not in use. Model 2 is the cheapest Concept 2 rower. It is recommended for crossfitters who want an indoor workout and also for most home users. 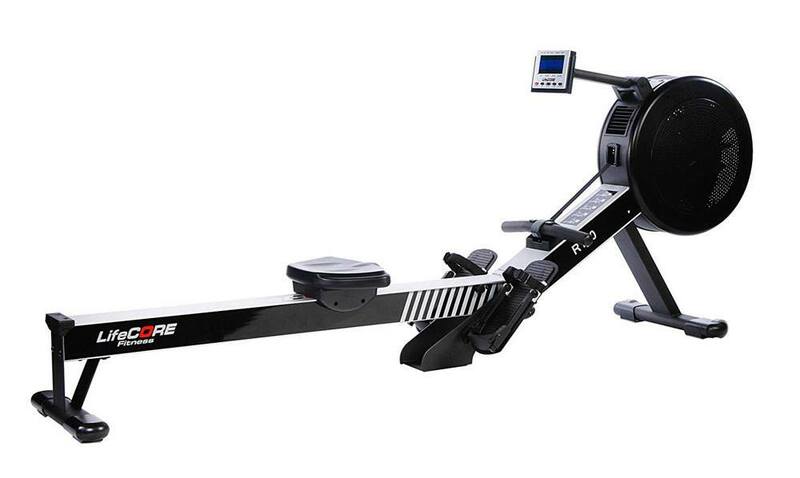 Concept 2 Model D is an air resistance rower. It comes with a spiral damper that allows you to adjust the airflow easily. It also lets you change or customize the feel of the stroke to match your taste. This rower sits low, with a deer height of 14” and the monorail is 52”. The Concept 2 Model D can last for a long time because of the nickel-coated chain. The frame of the rowing machine is aluminum. The weight of concept 2 Model D is about 57 lbs. Unlike the dynamic C2, the rail of Model 2 can be separated easily. This makes it easy and convenient to store. This machine just like the dynamic Concept 2 comes with PM3 ergometer as standard. The additional concept features will make the price to differ. These features include the customize length rails and performance monitor display types. You can’t adjust the seat height of Concept 2 Model D.
The overall length of Model E is the same as that of the Concept 2 Model D at 96” but is heavier at 65 lbs. 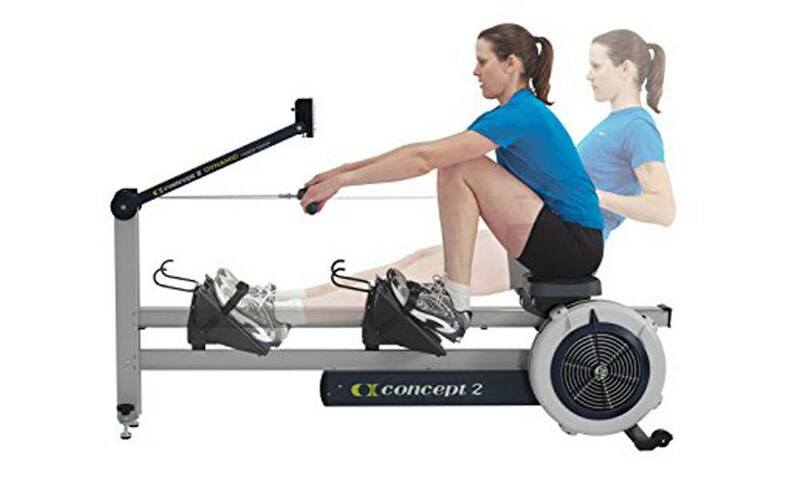 Another difference between this Concept 2 Model D rower is in the seat height. It has a higher seat at 20”. This seat height is good, especially if you have a bending or knee problems. You can store the rails as they can be separated. Just like that of Concept 2 Model D, you can get a longer rail at an additional cost. The welded steel frame feature makes the Concept 2 Model E good for commercial applications. This is the reason why you will always see it at CrossFit affiliates and gyms. The Concept 2 Model E, unlike the previous two, comes with the PM4 as standard. This is one of the best rowers for CrossFit training. It is a good substitute for Concept 2 models. This rowing machine is magnetic in nature. This simply means the machine has a smooth glide and super quiet function. This makes workout results more effective. This rolling machine is what almost all athletes look for in a home rower. This rower does not prove similar simulation for actual water rowing as the air resistance rower machine model does. You can cram in a workout from this rower with 16 levels of resistance. The LifeCORE r100 rower comes with 15 pre-programmed options. It also comes with four heart rate programs specifically designed with a Polar brand monitor to sync. The other features of this machine are a sturdy aluminum frame that has the support of steel, 94 inches, foldable rails for easy storage. The LifeCORE is made up of a cooling fan. It also has an angled footrest that is designed especially for a more ergonomically powerful rowing position. Despite this design, some users complain of heel problems and discomfort. Therefore, it better to test the rower in person before purchasing it. This rower is of good quality. The Stamina air rower is a perfect rower for crossfitters who want to engage and add in CrossFit training without spending beyond what they have. 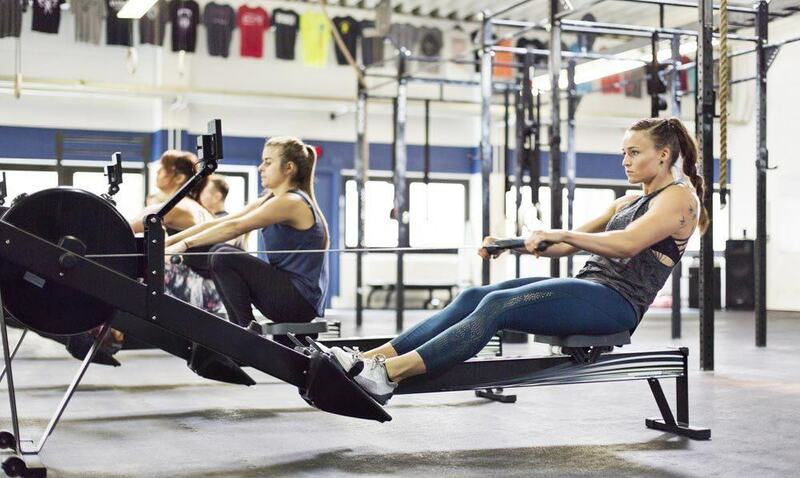 This rower is a fan resistance rower—just like the Concept 2 Model D. While the resistance intensity this rowing machine is great for rowing training that is for lower impact, experienced CrossFitters will do better with a slightly higher-level rower machine. Crossfitting beginners and intermediate athletes will do exceptionally well with this rower machine as it is inexpensive but still well built. The Stamina air rower has an extra-wide padded seat that glides smoothly and evenly. It is a good rower for athletes who are tall as the angled monorail is longer when you compare it to other rowing machines. You can pack force into your leg while rowing because of the adjustable shoe straps. You can also blast your hams and quadriceps without any discomforting your feet. This is not so in cheaper and smaller rowers. This rowing machine has a basic ergometer readout, time, distance, displaying speed, and calories burned. You can fold away the sturdy steel frame when you are not using the rowing machine. Furthermore, you can wheel it away without any difficulties. Rowing exercises are a great addition to any workout training program. Rowing is a great cardio substitute for the using and running an Airdyne bike. Rowers provide a better intense resistance workout and this is one of the reasons why rowers are a major option for best cardio machines made available on the market. Furthermore, rowers give crossfitters what they have not experienced before. Rowers come with moves like box jumps, squats, and others and this will be a great addition to your other CrossFit moves. Consider any of these rowing machines if you want to buy a rower for CrossFit—especially for indoor workouts.